The William Scott Abbott Trust has released a progress update on the extensive restoration of its 18th century Grade II* listed watermill at Sacrewell while also revealing that it is using a much anticipated new stone slate on its roofs. The £1.7 million restoration project at Sacrewell, near Wansford, Cambridgshire, began in July and is using a £1.4 million grant from the Heritage Lottery Fund (HLF) alongside Trust money. Sacrewell is thought to be only the second historic building in the UK to use manufactured Collyweston slates, produced using a commercial freezer unit. This follows pioneering work at Apethorpe Hall in Northamptonshire where Stamford based firm Messenger Construction conducted trials for English Heritage. 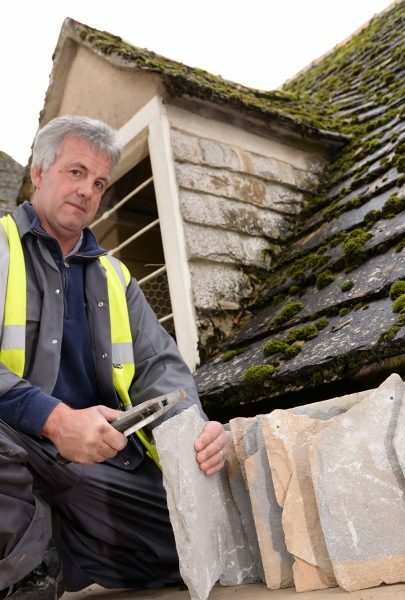 Mill project Officer Jane Harrison said: “Messenger is working closely with expert Collyweston Slaters to ensure we retain as many of the original slates as possible. “They have cleaned and sprayed the Mill House roof with anti-fungal treatment and are now commencing works to strip and re-slate the Mill building roof. The new slates will generally be used to replace missing or broken ones, to ensure the original guage of the slating can be retained. The facility to “make to order” specific size slates to suit the individual requirements of the project will further help to protect the historic detail of the building. This also complies with the English Heritage requirements of avoiding the use of re-claimed slates to make up any shortfall when re-roofing. Following two years of manufacturing trials with English Heritage and supervised by Dr Jefferson and staff from Sheffield Hallam University, Messenger has helped determine the precise process necessary to create ‘new’ Collyweston stone slates using an artificial freezing process. The traditional Collyweston stone slate is not a proper ‘slate’ at all but a type of limestone found in narrow beds. The stone hasn’t been quarried in any great quantity since the 1970s and so is a much prized roofing material. Messenger uses a large commercial deep freezer unit to replicate the splitting process which would normally have occurred when the large limestone slabs were exposed to frost during the winter months. Once the imitated frosting and thawing process has been able to highlight the natural bedding planes within the stone, splitting or ‘cliving’ of the stone is undertaken by hand by skilled Messenger stone masons to create the dressed and sized ‘slates’. Messenger’s ‘new’ Collyweston stone slates will be expertly fixed alongside the existing Collyweston stone slates to two roofs at Sacrewell. 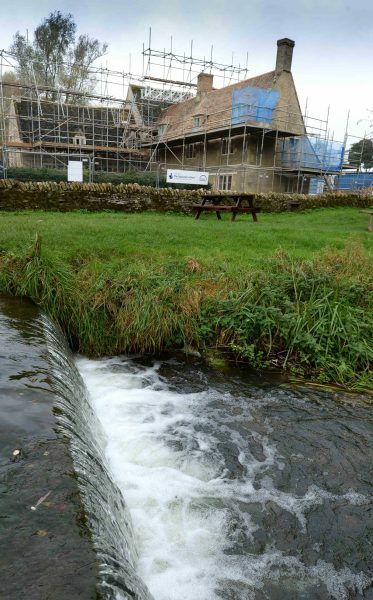 Over the past four months, Messenger has been busy working at the back of the mill, casting reinforced concrete walls to stabilise the building and repairing the mill races to help with the flow of water from the mill pond through to the wheel. The stable block has also undergone damp proof treatment and is now water tight. This area will form the start of the visitor route when the mill reopens in summer next year.